WASHINGTON (CNN) - Rush Limbaugh isn't the only one calling Sonia Sotomayor a racist. 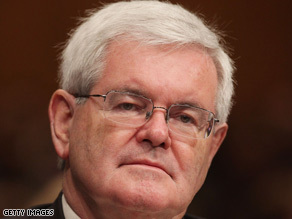 Newt Gingrich is, too - and he's demanding that Obama's pick to the Supreme Court withdraw her nomination. On Twitter, Gingrich pointed to a line in Sotomayor's 2001 speech to a Hispanic group in Berkeley that has drawn fire from some conservatives. "I would hope that a wise Latina woman with the richness of her experience would more often than not reach a better conclusion than a white male who hasn't lived that life," Sotomayor said in that speech, describing how life experience can inform judicial opinions. On Wednesday, Gingrich tweeted: "Imagine a judicial nominee said 'my experience as a white man makes me better than a latina woman.' new racism is no better than old racism." Moments later, he followed up with the message: "White man racist nominee would be forced to withdraw. Latina woman racist should also withdraw." White House spokesman Robert Gibbs responded to Gingrich's criticism at Wednesday's briefing. "I think it is probably important for anybody involved in this debate to be exceedingly careful with the way in which they've decided to describe different aspects of this impending confirmation," Gibbs said.